Published on January 8, 2012 in Finance, General T&T, People's Partnership and Politics. 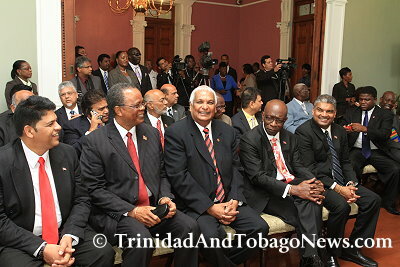 4 Comments Tags: Central Bank, Ewart Williams, Finance, Politics, Raffique Shah, T&T Govt, Winston Dookeran. WITHIN recent times, I’ve had an uneasy feeling that this country is drifting around aimlessly. I sense that in the economic turbulence that has gripped much of the world, we have let go of the rudder of the ship of state, and cast our fate to the wind and the rough seas without even trying to steer a course to safety. Published on October 11, 2011 in Finance, General T&T, Labour, Opposition Party, Parliament, People's Partnership and Politics. 1 Comment Tags: Budget, Jack Warner, Kamla Persad-Bissessar, Keith Rowley, Politics, T&T Govt, Winston Dookeran. Published on October 9, 2011 in Business, Finance, General T&T and Politics. 6 Comments Tags: Kevin Ramnarine, Politics, Raffique Shah, T&T Govt, Winston Dookeran. FOR the first time in many years, I am worried about the state of this country’s economy. I am not among alarmists who see doomsday whenever the price of oil dips by a dollar. To the contrary, in the wake of global financial crises of 200-08, when commodity prices tumbled, I didn’t even blink. Now, however, I’m wincing. Published on July 5, 2011 in COP, General T&T, Opposition Party, PNM, Politics and UNC. 2 Comments Tags: Politics, Stephen Kangal, Winston Dookeran. The PNM with the longest sojourn in the governance of T&T now has no alternative but to review and radically revamp the secrective and undemocratic nature and nurture of its long outdated and corrupted delegate system used to elect and determine its leader and governing National Council. Published on May 24, 2011 in General T&T, Media, People's Partnership, PNM and Politics. 6 Comments Tags: Jack Warner, Kamla Persad-Bissessar, NACTA, Politics, T&T Govt, Winston Dookeran. 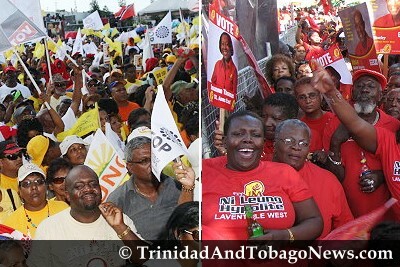 The findings of an opinion survey conducted by NACTA over the last week show the incumbent People’s Partnership (PP) Government has lost support while the PNM has managed to hold on to most of its support, just a year after the coalition won office by a landslide. However, if an election were called now, while the PP is likely to lose several seats, it will still retain office though by a narrow majority. Voters do not see any threat to the Government and they do not view the PNM as a viable alternative. The poll also shows Ministers Jack Warner, Roodal Moonilal, Glenn Ramadharsingh, and Vasant Bharath leading their colleagues in ratings for performance as well as in other measurements.